Gracious words are like a honeycomb, sweetness to the soul and health to the body(Proverbs 16:24 ESV). Then I spotted her. She sat on a bench with colorful scarves for purchase draped over her arm. A blue, yellow and red headdress wound around her head, and a purple full-length dress hung loosely from her shoulders. The bright colors shone against the backdrop of polished mahogany skin. What appeared to be her “handler” shared the bench with her. I walked over and bent low to look her in the eyes. “You are so beautiful,” I said. “Deese?” she questioned as she held up the scarves for examination. “No, not the scarves,” I replied. “YOU are beautiful!” I waved my hand from the top of her head to the hem of her dress and back up again. "YOU, all of you!" I walked back over to the group I was traveling with, and in a few moments I felt a tap on my shoulder. It was the woman. Without words, she handed me a bracelet, one I’m thinking she had made herself. It wasn’t anything fancy—just little white lettered cubes with alternating black beads strung together with elastic. But I wonder what it cost her to give it to a tourist. I didn’t offer to pay for the gift. That would have taken away her pleasure in giving it. I did hand her a few coins for allowing me to take her picture. I showed her the image of herself in my camera. “Beautiful,” I said once again. She smiled with a nod. Walked back to the bench. And handed the coins to the man. I don’t know what this woman’s life is like. I pray my assumptions are wrong. But I do know this: For one brief moment in her monotonous day of pedaling scarves, she felt lovely…because someone stopped and noticed her. Oh how easy it is—this speaking a word of encouragement—this speaking words of life. As you go about your day, look for opportunities to say a kind word. I promise, you won’t have to look very far. Heavenly Father, I know that kind words are easy to speak. What I don’t know is why I don’t do it more often. Open my eyes and my mouth to speak kind words to those I come in contact with today. Use me as an instrument of Your grace to sweeten someone’s life today. Think of a time when someone encouraged you with his or her words. How did it make you feel? Become a sleuth today...be on the lookout for someone who needs a kind word. You could change the course of someone’s day...the course of someone’s life. Words are one of the most powerful gifts that God has given us. He didn’t entrust them to zebras, cows, or cats. He gave words to man! Wow! What a responsibility. 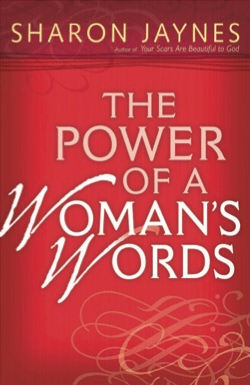 To learn more about how to tame your tongue and speak words of life to those around you, check out my book The Power of a Woman’s Words. It also has an accompanying study guide and DVD. It’s a perfect study for your women’s Bible study group.